Join the ambitious content marketing team in Southeast Asia as featured on Forbes! We are looking for a creative yet analytical people person marketer to develop and improve our content marketing research, campaigns and media relations in our Philippine market operations. As part of the content marketing team, you’ll develop e-commerce research and campaigns relevant in our operating markets (besides Philippines). Additionally, and more importantly, you are tasked to distribute our research and campaigns to some of the Philippines’ well-respected journalists or social media influencers and get it featured in digital, print or broadcast media. Are you creative-minded, data-driven and excellent in writing? Does networking and building mutually-beneficial relationships with journalists and social media influencers get you excited? Are you good in handling negotiations? Are you a hustler that don’t take “NO” for an answer? Then we have THE job for you. Entrepreneur- What Are the Most Popular E-Commerce Platforms in the Philippines? Create quality research and other content and digital campaigns to promote iPrice’s brand awareness in Philippines. To be successful in this role you’ll need to be constantly researching on the key industry trends in e-commerce, relevant to the iPrice brand and Philippine market and develop it in different formats like article, infographics or interactive content. Distribute our research and campaigns to the widest possible audience, by pitching it to Philippines’ top media, social media influencers and also leverage to all possible online platforms. Establish media relations with the local and international writers/reporters/journalists/bloggers. 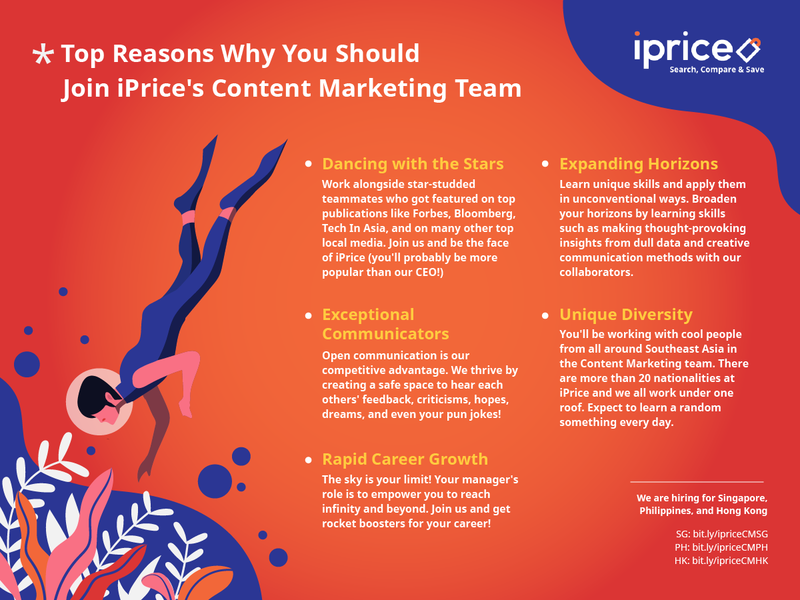 Collaborate within team members and other teams at iPrice to improve and develop content marketing research, campaigns and strategies. A relevat bachelor’s degree or equivalent working experience in marketing, research and/or public relations. Fresh graduates are welcome to apply but exhibits a strong interest in e-commerce, marketing and public relations. Familiarity in the Philippine culture, trends and media landscape. Locals are highly encouraged to apply. Must be creative and data-driven at the same time. Keen eye for good design especially for our interactive campaigns. Getting things done and hustling attitude – you never find excuses and won’t stop until you get your job done at the end of the day. Meticulous and highly attentive to important details especially in conducting research. Must have a professional verbal and written communication skills. (#bonus skill) Basic understanding of SEO. Be part of a hyper fast-growing organization (5x growth in the past 12 months) supported by solid funding. Experience the most exciting growth phase of a start-up first-hand – we are well funded with proven product, but still on an exponential growth path and providing each individual opportunity to change the way we do things. Enjoy diverse culture of more than 20 nationalities within the company. And yes, we are start-up full of young millennials who enjoys work hard play hard.